Railway Preservation News :: View topic - Operational Steam Crane Scrapped. In New York. In 2010. Operational Steam Crane Scrapped. In New York. In 2010. Post subject: Operational Steam Crane Scrapped. In New York. In 2010. Just found out some sad news. Seems the owners of the Tioga Transportation Museum in Flemmingville, NY decided to scrap out their railroad collection within the last few months. This included a D&H flanger, PRR gondola and steam powered crane from Cornell University. Seems in recent years the crane had even been operated on air. Sad. I don't remember ever hearing of the stuff being offered for sale. There are a few flickr links (not mine) attached below. The black flat car behind the crane is ex DL&W and was rescued, barely, by the DL and is now safe in Scranton. Wow, that is sad! Looks like it was small enough to be relatively easy to move if anyone was interested in saving it. Seems that cranes and other mow equipment are the Rodney Dangerfield of preservation, they just don't get the respect they deserve. I know of a west coast museum that de-accessioned a former steam crane many years ago and may scrap it the next time scrap prices rise. BTW, does anyone know if there is a list of preserved railroad cranes out there, including the big wreckers? John Taubeneck maintains a list of all cranes; including non-steam ones and wrecker cranes. Yes, they don't get the respect they deserve; but fortunately, quite a few have been preserved. It is a shame indeed that this one got away with a chance to go to a new home. So who are the ones responsible for this travesty? I want names! I'm gathering up pitchforks and fueling the truck! "So who are the ones responsible for this travesty? I want names! I'm gathering up pitchforks and fueling the truck!" Seriously, this stuff looks pretty good. And note the 10" air compressor on the crane; I'd bet it had a turbogenerator and a few other goodies that should have been salvaged. it is rather interesting that despite the massive 50-s steam scrappings, the steam cranes lingered in use for a while. I really feel bad about the loss of these pieces of equipment. Especially the crane and the PRR gon. I can't believe that this museum didn't at least offer them to the rail preservation world. What were they thinking? Is there any other RR equipment still left at this transportation museum? I'm unfamiliar with anything over that way,or was the stuff scrapped the only things they had in their collection? 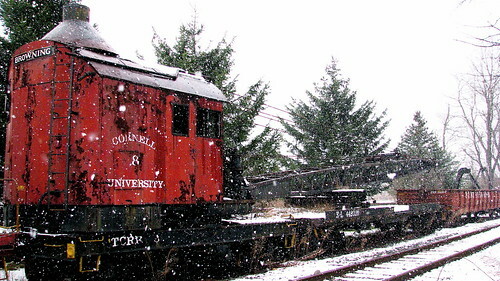 It's a shame this stuff wasn't offered to other museums or anyone interested that could have provided a home for it.That steam crane looked pretty neat looking to me and didn't look that bad in the photo.Did the steam crane have any other known previous RR heritage before going to Cornel University? As the case with most equipment today that places and people want to get rid of it's either offered at the last minute with only weeks if that to purchase and move and if you don't have the equipment,resources,and money to move the stuff it's off to the scrapper or they just plain scrap it outright without offering.I'm afraid we'll see more and more equipment disappear in the not so distant future. Is it possible that this museum (?) was being run without the guidance of an experienced curator, somebody connected to the railroad preservation movement? I've been in several where the collection was gathered up and nobody has a clue as to what is sitting in their care. Sure, they know they have a gondola, but beyond that, no idea of the heritage, use, or value. When it starts to look shabby, it's time to turn it in cash! Recently, I've been researching wooden boxcars and refrigerator cars, only to find multiple examples of rare survivors being left in the desert or unprotected with paint until somebody gets around to it, or whatever happens next. Time to pay a visit. The loss of this BROWNING locomotive crane is VERY SAD ! It's bad enough that very, very few locomotive cranes that are mechanically driven survive, but to destroy one that was still STEAM powered is INEXCUSABLE !!!!!!!!!!!!!!!!!! Steam powered locomotive cranes experienced the first re-powerings, first with gasoline engines and then diesel so any STEAM powered crane is a RARE item. This BROWNING was built in Cleveland, Ohio. Ohio was home to Browning, Industrial Brownhoist, McMyler Interstate, Ohio, Wellman, Marion, and Bucyrus Crane companies. PLEASE: Let's prevent this from happening again ! Yes to bad MOW and other types of equipment don't get the respect and attention they deserve. They are just as important in the devlopment of railroads as anything else. We've seen it happen many times before and it will happen agian going forward. The reasons are varied but the fact remains that there are going to be scrappings of valuable equipment. Some will be offered for adoption, some will not and there are those that will just disappear into the night. What can the preservation community do? The sad truth is that when an organization finds out by word of mouth that a piece is available and that organiztion wants it, they will keep it a closely guarded secret in order to assure no one else moves on it before them. But at the last minute, their funding falls through and the piece goes to scrap. I propose that there is enough equipment out there to go around. But we have to let others know that these gems exist so they can have every opportunity to be saved. But to do that, the preservation community needs to respect the other groups and keep their hands off of something another may want. Maybe make a contingency plan but keep your hands off until the primary group bows out. Was everything on a flanged wheel cut up? Perhaps there is a round two around the corner. It might be worth looking into. If I recall correctly, this was everything. There was once an 0-4-0T, fortunately that made it out to the Rochester & Genesee Valley RR Museum a couple years ago. The so called "Tioga Transportation Museum" and the Tioga Central Railroad were once intertwined to a degree, but I guess this hasn't been the case in a number of years. At the very least since the Tioga Central moved to Wellsboro PA. The museum itself seemed more like one person's carriage collection than anything else.